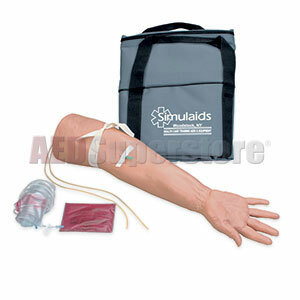 The Simulaids Geriatric IV Training Arm has been developed from a live cast, which makes this arm a unique IV training product. Among its realistic properties are veins that roll away or disappear as you attempt to catheterize the vessel, just like real veins. Also, the Geriatric IV Training Arm uses a specially developed skin that is exceptionally thin. If you are training students to work with the aged, this addition to your teaching lab will enable them to better serve in the future.